Perfect for salad bars, self-serve buffets, and more, the Edlund 4412HDL tongs have scalloped ends that can grab a variety of foods. Stainless steel springs make the utensil heavy duty, and the springs can be replaced if they are damaged. When the tongs are not being used, the locking mechanism keeps them closed. Read more about tongs and other smallwares in the kitchen supplies overview. "Yes, meets all expectations. 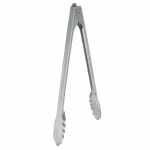 Solid, durable and never pinch"
"Great set of all purpose tongs. Adept on the grill or turning items in a skillet. Ends meet well allowing for good grip on food items. Well si..."
Great product will buy again! "Great set of all purpose tongs. Adept on the grill or turning items in a skillet. Ends meet well allowing for good grip on food items. Well sized. Nice spring action. Easy to close." "Heavy duty tongs that does not slide back and forth. Strong enough to pick up plates. Locking device allows for space savings."